50% off for first night with Passport America. Also accepts Good Sam. Camp alongside the Mississippi with views of Natchez and barge traffic. After hours there were lots of vehicles driving through the campground to access a venue next door. Nobody stopped them or rerouted them to the proper entrance. We?ll look for a different campground on our next visit to the area. Hard time rating this one. Really more like 3.5 stars. 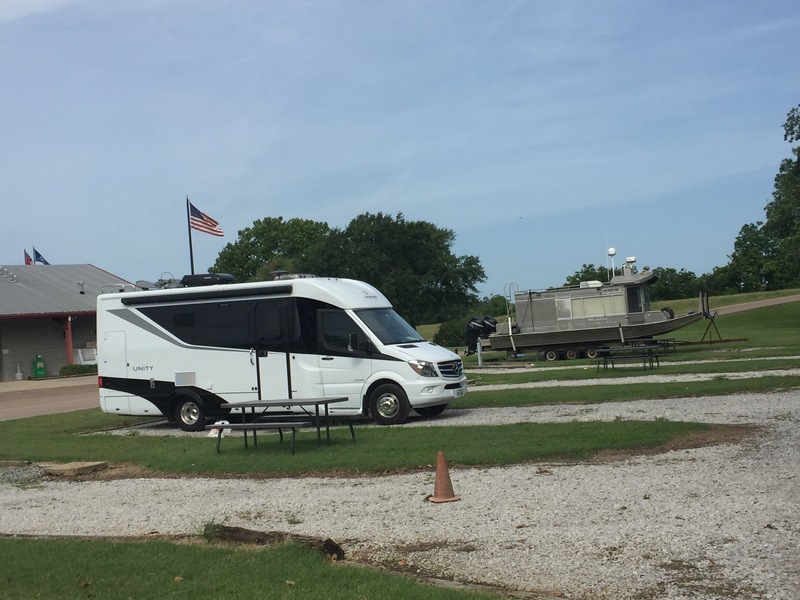 We booked River View RV Park as the first overnight to tour the Natchez Trace. It was conveniently located and was a perfect stop being so close to Natchez and the beginning of the Trace. We were there end of May, 2017 and it was very quiet. Not many other campers at all. We drive a 25' Motorhome and were given a site in the older section with FHU and picnic table. It was limestone, back-in (Site #3), no trees and fairly level. Not super fancy, but certainly adequate and we really didn't have any complaints. There are other areas of the park where it appears there are work-campers and/or full-timers. There is also a newer section, that was more populated with campers, that had concrete slabs. Had we been there any longer, I would have preferred that section. Admittedly, my impression of this park likely has a lot to do with being in the older section. There was a pool that a family was enjoying. The clubhouse was a nice place to chill and read and the staff was friendly. We took a nice walk, with our 2 dogs, up the path along the river and it was clear there had been some flooding from the recent heavy rains. That wasn't an issue when we were there as the water had receded, but could be an explanation for the somewhat unkept appearance of the section we were placed in. The river view was/is a bonus. The bathrooms were clean. I posted a photo of us and the houseboat a couple spaces over. I would stay here again if ever passing through, but would likely look for something with more amenities if we had kids with us or if we were planning on staying a few days. Certainly a fine, safe place to spend the night, and would stay here again for that purpose. We paid $19 with our Passport discount and can not complain about that great rate/value! I spent 7 days biking the Natchez Trace Parkway from North to South. River View RV Park was my reward. It was so refreshing to come to this park at the end of my journey! I had met a work camper, Tom, on an RV forum while planning my NTP ride. He told the staff about me and they were anticipating my arrival. They were all so very nice... and I got to meet Tom before he left! The sites were spacious. The view was incredible... like stepping back in time... loved how the bridge lit up at night. The small river walk took you to the Visitor's Center. My only complaint is that the hot tub felt more like bath water. My husband joked that in Louisiana they get in hot tubs to cool off... lol! I highly recommend this place! This is a very nice RV park. The sites are long and level and on cement pads. There's a nice picnic table at each site, and the grounds are well-kept. The building in which the office is located also has a lounge area with a tv and a book/video exchange, a gift shop, the laundry, and the restrooms/showers. That's also where the pool and hot tub are located. Everything is clean and the people are very nice. The laundry has two double-size washers and a triple-size washer and four large dryers. The double-size washers are $2.50 and the dryers are $0.25 for 10 minutes. I did what normally would have been 2 wash loads for $3.75. We walked along the riverwalk and watched the boats going up and down the Mississippi River. We really enjoyed our stay here. Cajun Specialties Meats & Seafood at 4321 Carter Street (Rt. 84) has good meat at reasonable prices; some prices are even lower than the grocery stores. It is family owned and operated, and the people in there are very friendly and helpful. Bowie's Tavern at 100 Main St in Natchez: We stopped in after a day of site-seeing and had their lemon-pepper wings. They were so good, we went back twice more during our two-week stay. Stayed 3 nights. Convenient location to sightsee in Natchez. Enjoyed watching barges on the river. Laundry facilities are some of the best I've seen at an RV park. Didn't use the pool or hot tub. Great free wifi. Very nice park. Great view of the Mississippi River. Lousy TV both air and cable. I would come back. I want to amend my earlier review. All but a few small sites have level concrete pads throughout the park. Good Sam and Passport America park. Two sections, north and south of the office. South section has gravel and grass sites, north section has level concrete pads. Location between the Mississippi and the levee makes a fine spot from which to watch river activities. Some shaded sites, some not. Restrooms are self contained with a shower in each one, well cared for. Didn't try pool as it was cold. Limestone roads make for some dusty condition. Seems a bit overpriced but some of that is due to high state and local taxes. Great event! Just needs to be a little more retained with the people coming in and out of the place. Would definitely come back again! Closest park to downtown Natchez, right across the river, sitting on the Mississippi between the river and the levee so you have a nice view of the river and the bridge. You can watch the barges. Large, well-cared for park. Half the sites have perfectly flat concrete pads, the other sites are on the grass. Interior roads are variable quality gravel roads. Large office area with lots of tables, games, store. Advertises wi-fi, but you have to be in the area surrounding the office to get it and then it is s-l-o-o-o-w, so slow I gave up trying to write this review! Nice laundry. But I gather most guests use their own bathrooms because the only public ones are in the center in the office, a l-o-o-o-n-g way away from most of the sites. However, the bathrooms are each a self-contained bathroom with shower, toilet and sink. Has cable TV connection but only 5 channels.